Home / Posts tagged "mobile app development company in USA"
Why need Agile methodology for Mobile application development? Mobile technology is changing day by day, and it had evolved a lot from its beginning days when it used as merely a calling tool. Nowadays, it has been using for a task such as texting, video calling, scheduling meetings, spending and receiving emails and managing social media, which has become possible with the help of mobile application development services. Nowadays, companies started utilizing in an agile methodology which is most efficient in use by mobile and software development companies also helpful in streamlining the critical development process to make it faster. Agile mainly focuses on flexible planning, the involvement of customer, risk management and continues evaluation, which helps the development team to design an end product precisely as per the expectation of their customer. Agile is a product development approach in which the entire task is segregated into different development cycles for which it requires dividing a complete task into different sub-tasks, and thus each task became a separate module for a development team. Therefore, the whole project becomes an integration of different modules. Then each module assigns to dedicated specialists which looks like an independent project. 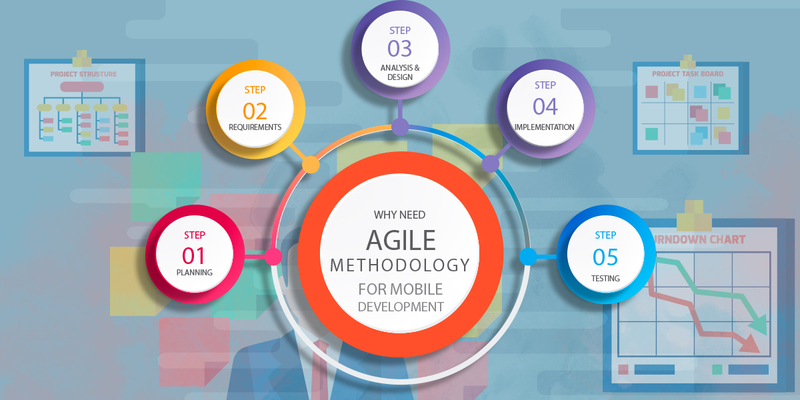 Reason for using the agile methodology for mobile app development? Mobile app development is a complex task because manufactures undergo a rapid change which receives several updates as compared to the desktop. So, the difference in the hardware, software and different networks heightens its complexity even more as it is quite diverse as different users interact with their smartphones in different ways, which requires customer involvement, planning, regular evaluation, and risk management. So, this flexible approach can use in the complex projects where the requirements of the customers change from time to time along with that it also requires you to engage with your customers regularly and take their feedback from time to time. How Agile helps mobile app Development Company to develop high-quality apps? Self-organization responsibility, flexibility, and the leadership Agile method make it possible to create a sustainable, high-quality mobile app. It helps in mastering several issues which developers face using the traditional app development methods such as different demand of users, seamless development, different operating system, an unexpected amendment from a customer during project development and much more. Advantages of using Agile in the development of mobile app involve flawless communication inside the group where it enables continues interaction between the customer and development team which makes the process transparent and flexible. Hence, at any stage if the customer needs to change something or add in the project, it will not alter the rest process also additional changes can be carried out by the concern team so, the speed of the development process does not effect. The agile methodology enables numerous scopes for improvements to the complete life cycle of app development. It helps to provide a frequent update with implementation also fix bugs to give users unmatched experience. Each stage requires testing to make the product seamless. With the interaction of the developers, customers, and testers, it enhances the flexibility and transparency of process. Efficient application process enables to increase the quality and performance of the project. It also helps to enhance design responsiveness, sustainability in app usage. Below given the benefits of the Agile Methodology – Agile provides numerous benefits the users, businesses, and developers. Helps to launch the project sooner. Help to provide customer satisfaction by rapid delivery of app modules. Helps to know the customer in a better way. So, for wrapping up the need for selecting the agile methodology becomes an adequate approach for mobile app development companies because it delivers numerous benefits over the traditional method of app development. It also allows customers to involve closely in the process of making faster decisions throughout the process. In order to meet a desirable objective of end users expectation and achieve the tangible results to a mobile app development companies must choose the agile for developing mobile apps. Looking for some exclusive strategy to improve app engagement? Well, customer retention must also be your prime focus then! This post is going to give you a sound brief about some important tips you should follow while perking up app engagement. The mobile app development services you are offering should always be properly synced up and for the same, you should never be casual towards an ideal app engagement. With a sharp rise in the use of internet connected devices, the demand for mobile-based applications has also escalated like never before. Especially, with today’s marketplace withstanding a radical transformation and all the favorable outcomes depending on providing a mobile app as one of their main channels, the chance for customer satisfaction has also manifolded to a significant extent. This is one of the most effective reasons why mobile application companies are on the leap and mobile application developers are so much in demand.